Give your interior an upgrade with our one-of-a-kind Carpet Liners. These Carpet Liners are specially designed to give your 2018 Land Rover / Range Rover Discovery the same absolute interior protection provided by our standard FloorLiners, while also providing a layer of durable carpet for a stylish look and lavish feel underfoot. Made with a patent pending High-Density Tri-Extruded (HDTE) material for enhanced strength each Carpet Liner is laser measured and custom made to fit perfectly in your 2018 Land Rover / Range Rover Discovery. Featuring specially designed retention systems (where applicable), you’ll be assured that these Carpet Liners are manufactured to work specifically with the retention equipment your manufacturer has already installed in your vehicle’s footwells. The carpet inserts are made using nylon construction, with a density that far exceeds typical industry standards, providing maximum color-fade resistance, durability, and makes each insert easy to clean. Taking advantage of the Surebac™ system gives each insert a non-slip backing, and combined with the stainless steel fasteners you can be sure each insert will remain securely in place no matter where you’re headed. Those same fasteners also make each and every insert quick and easy to remove, for when they’re in need of a cleaning. 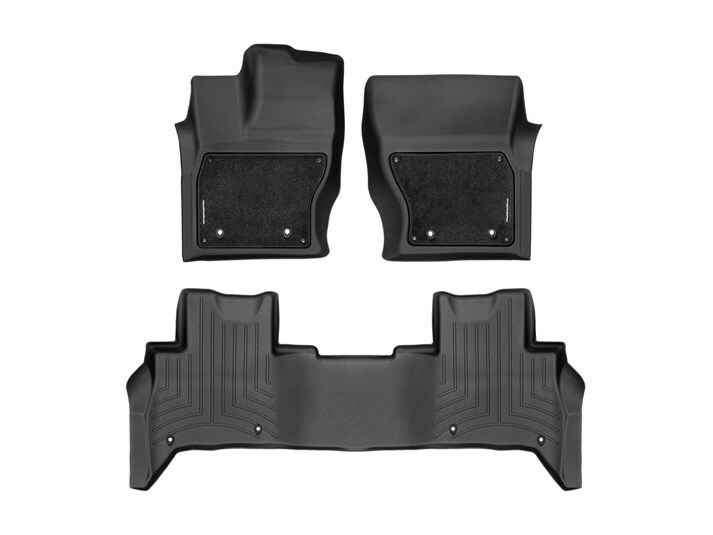 These Carpet Liners are the ultimate in interior protection, now available in black for select vehicles! Absolute Interior Protection: lines the front, side and back of your vehicle’s footwell. High Density Tri-Extruded material: provides extra strength and surface friction to reduce movement. Specially Designed Retention Systems: fully adapt to vehicle devices for a secure fit (availability contingent on vehicle’s existing retention devices). 32oz. carpet density exceeds industry standards for superior durability and luxurious feel. Nylon construction provides color-fade resistance and makes inserts easy to clean. Cable serged edges increase carpet durability and prevent fraying. Surebac™ backing system provides a non slip surface and easy cleaning. Black Stainless fasteners are corrosion resistant and ensure the insert stays in place. Are the carpet inserts machine washable? Should I remove the inserts on bad weather days? It is not required to remove the inserts during bad weather conditions, however you do have to option to do so. Am I able to purchase replacement carpet inserts? Yes, replacement carpet inserts will be available for purchase. Can I put the Carpet Liners on top of or under my factory mats? How do I remove the Carpet Liners from my car? Some vehicles utilize posts, snaps, hooks-and-loops, as well as other retention devices that require a 90-degree twist to remove-and-install. Please refer to your vehicle owner’s manual for the proper instructions on the use of your particular vehicle’s floor mat retention system. Once identified, refer to the instructions supplied with your Carpet Liners. Do I have to trim my Carpet Liners? How should I clean my Carpet Liners? Our specially formulated TechCare Cleaner and Protector Kit and TechCare® Carpet Cleaner with SpotTech is designed specifically for this task. However, mild detergent, warm water, and a soft-bristle brush will also help clean the Carpet Liner. Do not clean with harsh chemicals or apply silicone-based cleaners (such as Armor All).